5 turn incised worm, serrated edge capsule cutting blade, and a lever with a crown bottle cap remover. Personalization by color or laser imprint is available, with the handle imprint area 6 centimeters long by 6 millimeters high. Bulk packed in groups of 6. Available in a cardboard gift box or imitation leather pouch. 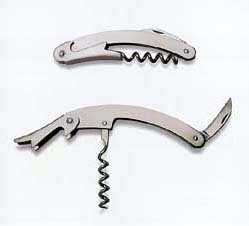 The Trendy is an attractive, slim lined all stainless steel wine waiter corkscrew. 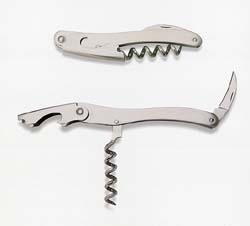 It comes with a five turn incised worm, serrated edge capsule cutting blade, and a crown bottle cap remover on the lever. Personalized by color or laser imprint is available, with the handle imprint area 5 centimeters long by 5 millimeters high. Bulk packed in boxes of 6. Available in cardboard gift box or imitation leather pouch. 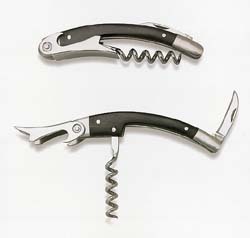 The Arko is a combination stainless steel and tiger wood handled wine waiter corkscrew. Its elegant design is perfect for both promotional events and use as a gift. It comes with a five turn incised worm, serrated edge capsule cutting blade, and a crown bottle cap remover on the lever. Personalization on the handle is available, with the imprint area measuring 5.5 centimeters long by 6 millimeters high. Bulk packed in groups of 6. Available in cardboard gift box or imitation leather pouch.